Green Ops has a unique staff of special operations instructors who have extensive experience in their fields. Our special operations instructors include former and current members of military and law enforcement special operations units. Mike served over 15 years in Special Forces, including three years as an Assaulter in a CINC’s In-extremis Force (CIF), focused on Direct Action & Counter Terrorism missions. He also served as an instructor for the Special Forces Advanced Urban Combat (SFAUC) Course where he taught Advanced Marksmanship and Close Quarters Combat (CQC) training courses. Michael has been teaching tactical firearms since 1992 and holds a Master classification in IDPA and USPSA. He has Instructor ratings from multiple organizations including the NRA, the Federal Law Enforcement Training Center, the US Army, SUREFIRE, Sig Sauer Academy and Tom Given's Rangemaster Instructor and Advanced Instructor programs. After leaving the military, Mike spent several years on numerous overseas US Government contracts. As a firearms Subject Matter Expert (SME) he is currently hosting and co-producing his third season on a National Television show (Trigger Time TV) that is aired weekly with up to 45 million potential viewers, with an estimated reach of 20 million unduplicated homes in the US. He has consulted for numerous training facilities, developed, planned and implemented training along with providing instructor development. He has been a lead instructor, consultant, or Director of Training at over 10 different training facilities. He has trained civilians, Special Operations, military and law enforcement units in the US and throughout the world. “P” or Pascale is a competitor in the shooting sports and a defensive firearms Instructor at Green-Ops. After obtaining her CCW permit, and receiving tactical firearms training, Pascale was exposed to competition shooting. Pascale’s qualifications include: Tom Given’s Rangemaster Firearms Instructor Development program, NRA Pistol Instructor, Range Safety Officer, IDPA Expert class (SSP), USPSA “B” Class (Production), graduate of over 15 formal shooting courses, over 11 years of martial arts experience (2nd degree black belt in karate) and CrossFit Level 1&2 Trainer. As a mother and proud supporter of the 2nd Amendment, Pascale hopes to inspire more women to join the shooting sports and to also become an ambassador to the shooting industry. Fred is a full-time law enforcement officer with an agency in the Washington D.C area. He is also a Field Training Officer (FTO) and full-time law enforcement firearms instructor. Prior to this, Fred served in the U.S Army for eight years, deploying to the Former Yugoslavia several times to support international peacekeeping operations in Bosnia & Herzegovina. After leaving the military, he would deploy multiple times to Iraq and Afghanistan, in support of DOD efforts in the Global War on Terror as an intelligence & security contractor. Fred has also trained and qualified support contract personnel in the use of small arms prior to their deployments in the Global War on Terror. Fred is a graduate of the Federal Law Enforcement Training Center (FLETC) Firearm Instructor Training Program (FITP), and Rangemaster’s Instructor and Advanced Instructor development programs. He has trained with many of the very best in the training industry, to include Larry Vickers, Kyle Defoor, Mike Green, Todd Louis Green, John Murphy, Jared Reston, Tom Givens and Bob Vogel. To date, he has completed over 400 hours of formal firearms & instructional training and is an avid student to this day. Fred is a strong supporter of the 2nd Amendment and has shot competitively in KSTG as well as 2-Gun matches. Chris a 20-year veteran of the United States Army. Retiring as a Master Sergeant in 2016. He is Special Forces, Ranger, Pathfinder, Jumpmaster and Military-Freefall qualified. During his service he completed five operational deployments to the CENTCOM and SOUTHCOM areas of operation. Throughout his multiple deployments, he has been the lead for platoon level kinetic operations and has trained and advised elite host nation forces. He has served as the Master Trainer for the Peruvian Security Forces’ the most elite Special Operations Forces supporting U.S. Inter-Agency sponsored activities with an emphasis in Counter Narco-Terrorism, Counter-Transnational Organized Crime (CTOC), and Advanced Pistol/Rifle Marksmanship. He is also trained and highly proficient in Medical Training, Force Protection, and Non-Tactical Vehicle (NTV) Convoy Operations. He has also worked as a contractor for F3EA assisting in training US Special Operations Soldiers in conducting Full Mission Profile (FMP) exercises. Chris is a 3-time competitor in The Tactical Games (TTG). He is an athlete and a competitive shooter. He has attended numerous prestigious firearms training classes with the best in the industry such as: Special Forces Advanced Urban Combat Course (SFAUCC), Military Mobile Force Protection Course (Gryphon Group), Dave Borresen (3-Day pistol/carbine course, Tigerswan), Steve Fisher (Sentinel Concepts), Scott Jedlinski (Modern Samurai Project), Pat McNamara's 2-day carbine Tactical Application of Practical Shooting (TAPS) and Green Ops. Chris is a General Instructor Entry Level Course and Firearms Instructor Entry Level Course for the Virginia Department of Criminal Justice Services (DCJS) and NRA Certified Pistol instructor. He holds a NC concealed carry license since 2014 and has experience with multiple carry methods and types of equipment. Joshua is a professional Intelligence Officer specializing in national security issues. Since 2012, he has completed four deployments to Afghanistan supporting the US Military Counter-terrorism effort. Josh has been shooting competitively since 2015, and has shot over 100 matches including USPSA, IDPA, Multi-gun and Steel Challenge. He is currently classified as Master in three equipment divisions of USPSA and IDPA. He has attended ~130 hours of formal firearms training including classes with Tim Herron (Grand Master competitive shooter), Scott Jedlinski (Modern Samurai Project), Ben Dewalt (Onsight Firearms Training), Chuck Pressburg (Presscheck Consulting), John Chapman (Forge Tactical), Justin Dyal and Defense Intelligence Agency Pistol qualification courses. Josh has held a concealed carry license since 2013 and has experience with multiple carry methods and types of equipment. 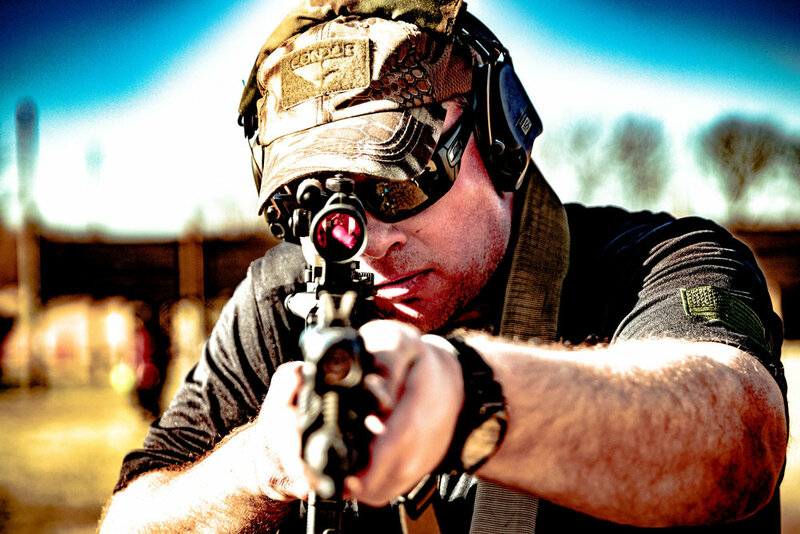 Mr. Shaw is an editor and regular contributor to Spotter Up Tactical Solutions (https://spotterup.com/), specializing in product reviews, shooting and training articles and AARs. He is also a very active member of the Spotter Up shooting team, mainly competing in the Mid Atlantic states (VA/MD/WV/PA/DE). Mark started his career in 1987 in Army Special Operations with the 3rd Battalion, 75th Ranger Regiment. He also worked at 4th Ranger Training Battalion, and was one of the first Instructors at the National Guard Bureau Scout Sniper School at Camp Robinson in North Little Rock, Arkansas. In 1998, Mark joined the US Border Patrol and was assigned to the Ysleta Border Patrol Station until just after 9/11. Immediately after 9/11, Mark was one of the original Federal Air Marshals who stood up the Orlando Field Office. In 2007, Mark accepted a job with the Defense Intelligence Agency as an Intelligence Officer and conducted clandestine intelligence operations across four deployments in Iraq and Afghanistan among other countries. In 2015, Mark left government service for the private sector where he continued to work as an independent contractor in the Middle East and Africa, as well two more deployments to Iraq in 2016. In 2017, Mark was the original Project Manager responsible for standing up the WPS2 TO-12 contract security element for the US State Dept. Mission in Mogadishu, Somalia. Mark also competes locally in USPSA matches. Jeff is a Veteran of the United States Marine Corps and then spent over a decade on protective details for individuals and families such as CEOs, US Foreign Service officers and Ambassadors, NGO personnel, and celebrities. Since 2012, Jeff has been an instructor on several US government agency pre-deployment courses, preparing personnel to carry out their missions in hostile and unfamiliar environments. Subject matter covered has included surveillance detection, vehicle preparation, self-defense for overseas travel, immediate action drills, hostage avoidance/survival, being the subject of a protective detail, personnel recovery, and mission planning.